Ensemble casts pose an interesting challenge, both for anime and for fiction in general. When they work, they work incredibly well. Having a rotating group of star characters opens up a variety of story possibilities and saves any one individual from having to carry too much of the show’s weight. The hard part is convincing the audience that they should care about yet another gaggle of unfamiliar faces. In this column, I’ll take a look at how the action comedy Assassination Classroom handles the challenge of making a large cast work. The biggest issue with a large group of characters is that even the best writer can only develop so many of them at once. Trying to introduce everyone right away often results in an absolute mess; the story goes nowhere and each individual is reduced to a couple of obvious traits or motivations. On the other hand, an ensemble cast only works if it has a critical mass of interesting characters. Getting the ball rolling while convincing the audience to pay attention can be a difficult and thankless task. 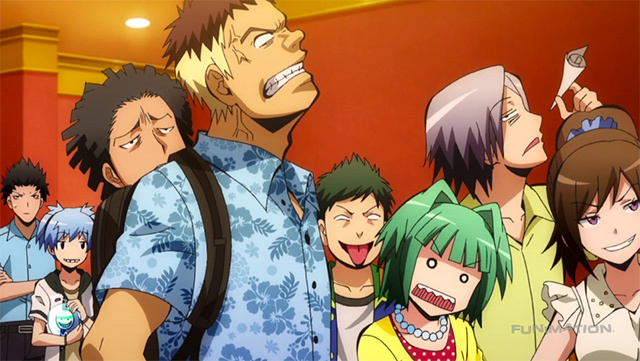 There are a few common solutions to this problem, and Assassination Classroom uses a fairly simple one: in its early stages, it only focuses on one character. The series has a strong and immediately likable star in Koro Sensei, the big yellow mutant who acts as the literal and figurative face of the show. 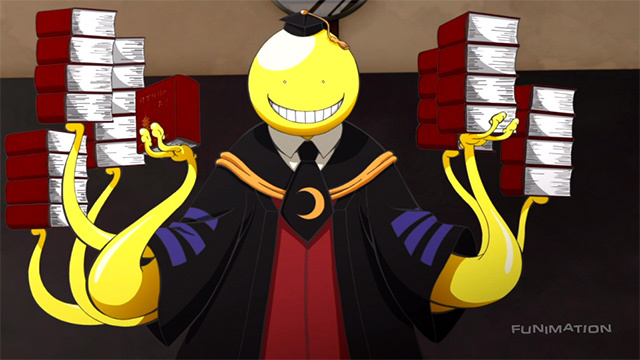 The contradiction of teaching a class of kids to foil his own apocalyptic plan is a compelling one, and Koro Sensei’s personality produces just as much comedy as his bizarre appearance. He’s got enough on-screen presence that the rest of the characters can just sit back and react to his eccentricity alongside the audience. For the first few episodes, Koro Sensei provides enough entertainment that viewers will come back just to see what he does next. This gives the show the time and space it needs to establish the rest of the cast. The problem with this approach is that it comes with a major and ultimately disastrous temptation. When you’ve got a recognizable and popular star, it’s easy to forget about everyone else and let that one character carry the show. Assassination Classroom falls into this trap from time to time, phoning in the story and relying on Koro Sensei’s antics to keep things interesting. This only works in the short term, and it can bring a series down over time; even the most iconic star can run out of steam, and leaving the rest of the cast as a bunch of flat cutouts makes it tough to sustain anything resembling a plot. Luckily, there’s an easy way out. Assassination Classroom is a bit hit-or-miss when it comes to taking this route, but it certainly has the right idea. Rather than just having the series revolve around its initial star, the writers can use that one character to help develop the others. As Koro Sensei interacts with his students, we gradually get a sense of who each one of them is. Over time, class 3-E goes from a group of sidekicks to a collection of viable protagonists. Not all of them can carry an episode solo, but as a group they’re able to take on a wider variety of storylines than Koro Sensei ever could. Little by little, Assassination Classroom transforms itself from a one-octopus show into a group effort. The series is stronger as a result, and it saves Koro Sensei from wearing out his welcome. This approach relies heavily on the strength of that one initial star, which may be why many ensemble shows choose to follow a different route. Next week, I’ll take a look another option that’s worked well for some of Assassination Classroom’s contemporaries.